THIS is Longbox Junk. And while I DO feel a need to try to pay a small amount of tribute to a man that stood larger than life as the outspoken and ever-present goodwill ambassador of comic books for. . .well. . .pretty much my entire life, I'm not one to reach for the low-hanging fruit. No. . .if I'm going to show MY respect for Stan The Man, I'm going to dig a little deeper and go right past those well-known issues that are probably FAR beyond the budget of most comic collectors (outside of reprints and collections) and talk about a great Stan Lee story that can be found in original copy at quite an affordable price that will certainly be passed over by many collectors in favor of more "valuable" comics. Rest In Peace Stan Lee. You taught me that the value of comics isn't just measured in dollars. I didn't know you, but I'll miss you, and the world will be a sadder place without you. 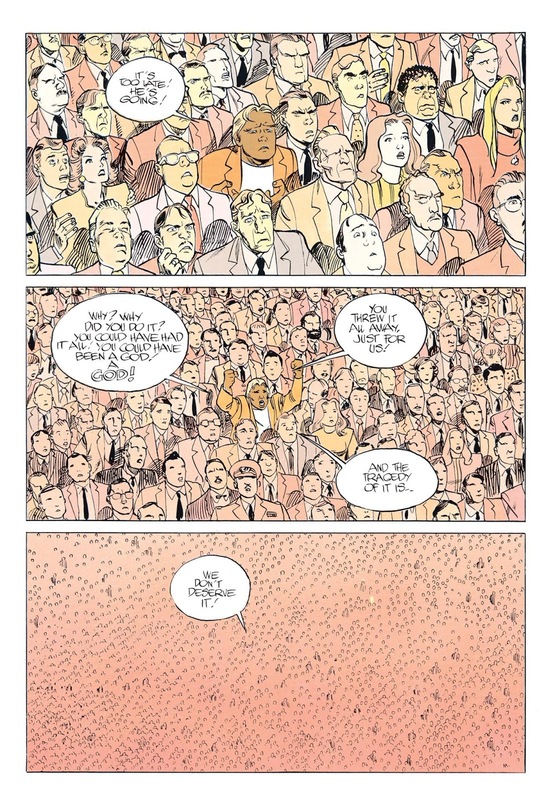 So from what I've read about this odd little two-shot, it came from a chance meeting of Stan Lee and French artist Moebius at a comic book convention. 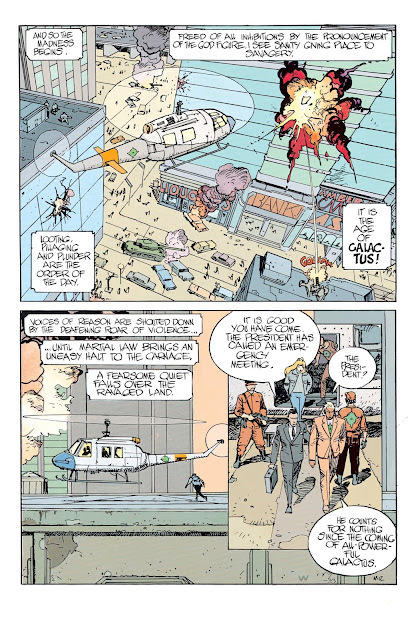 They were in almost immediate agreement as to what character they should collaborate on and the issues were written using the "Marvel Method" of Stan Lee writing an outline and letting Moebius build the visuals around it, then Stan doing the finished dialogue and Moebius putting in the final touches (including the lettering). 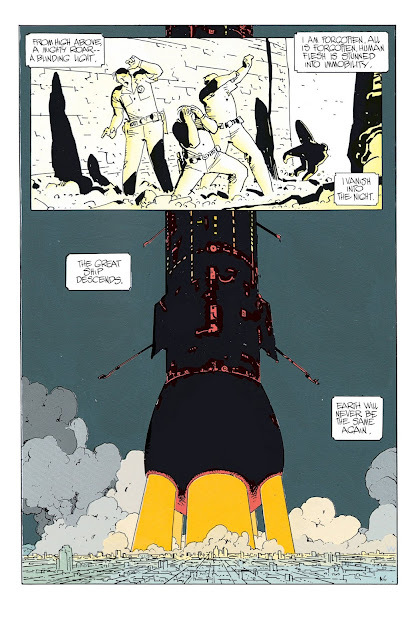 Moebius saw this project as a bit of a self-challenge, as he'd never worked on an actual mainstream superhero comic book before, and he had to make some changes to his art (in particular the coloring) to fit the newsprint the comics were printed on. In an interview I read about this comic, Moebius claims it was one of the hardest projects that he'd worked on, as the color palette was extremely limited compared to what he was used to. At the time of publication, this comic sold very well (It had a pretty high print run, which is probably why it can still be found in dollar boxes today) and was well enough regarded that it won the Eisner Award for best finite series. I find it strange that despite the good reception and critical accolades, it seems to be somewhat forgotten and certainly not very "valuable" to collectors today. But enough about that. Let's get into it! A gigantic spaceship is sighted heading for Earth, plunging the population into fear and panic. When it lands, the huge figure of Galactus comes forth and demands that mankind worship him, and that their obedience to him will usher in a new age for the planet. Almost overnight, religions spring up around Galactus, the primary one being led by Evangelist Colton Candell. . .who positions himself as the self-appointed prophet of Galactus. As Galactus declares his followers worship him by throwing aside their laws and inhibitions and do as they will, the Earth quickly descends into chaos and anarchy. 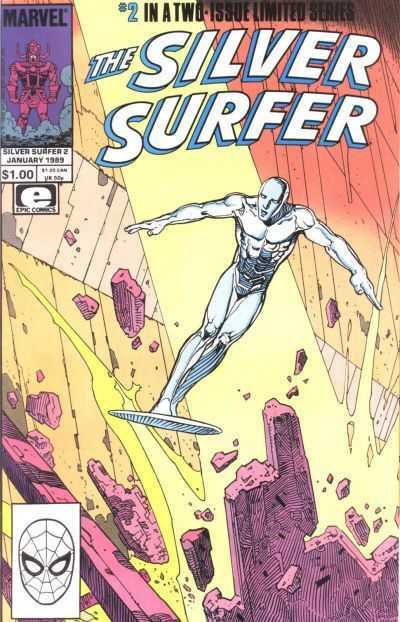 The Silver Surfer, who has been living in exile (and disguised as a hobo for some reason) on Earth since Galactus' last visit, finally has enough of the chaos and decides it's time to confront Galactus and find out why he's returned when he previously vowed not to harm Earth or Mankind. And that's pretty much it for the first issue. It's a deceptively slim story. . .Godlike alien lands on Earth and demands obedience. Mankind falls into chaos and religious fanaticism. The forgotten hero decides to take a stand. But despite the somewhat skeletal framework, there's quite a bit to chew on here. Basically, this first issue asks the question, "What would happen if (a) God was right THERE telling you what to do. . .even if it was against what you believe in? Would you have the courage to resist, or would you just join the crowd and do what you were told to do?" It's well written and Stan Lee steps outside of his usual bombastic superhero box to ask the reader some hard questions. There's very little traditional "action" in this comic beyond a few scenes of Earth falling into chaos and rioting. There's also no other superheroes on the scene of this worldwide event, which I found odd in light of Stan Lee being one of the creators of the modern connected "Comic Universe". Judging from the title, I'd venture to say that the oddly isolated nature of this story is meant to teach a lesson more than it is to entertain with superhero appearances. An interesting departure from what one would expect from someone like Stan Lee, who usually revels in the extended Marvel Sandbox of heroes he helped create. The art was also somewhat unexpected. I'm mostly familiar with Moebius through his "Blueberry" western series. The lines are a lot thinner than in Blueberry. . .almost to the point that it looks like the work of a different artist. The thin lines, sparse backgrounds, and flat colors combine with very cinematic angles and an unusual lettering style to perfectly complement a story with hardly any traditional superhero action. 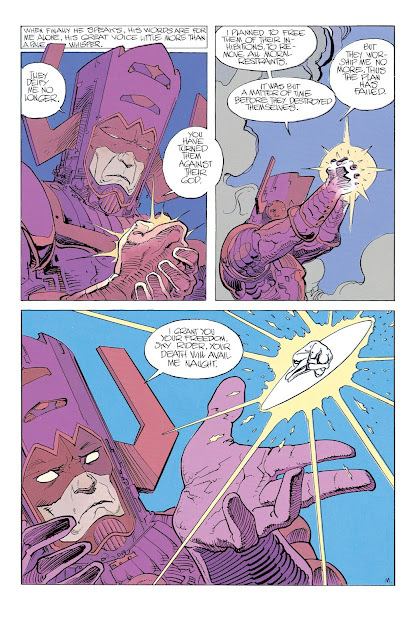 Moebius gives what is (in my extremely humble opinion) one of the WORST Marvel villain designs an actual presence, weight, and sense of size that is impressive. . .especially considering that we're talking about a giant purple-clad guy with a ridiculous hat. Overall, this first issue was a great read. Stan Lee took a skeletal narrative that can be summed up in 3 short sentences and fleshed it out with a surprising amount of thought-provoking dialogue. 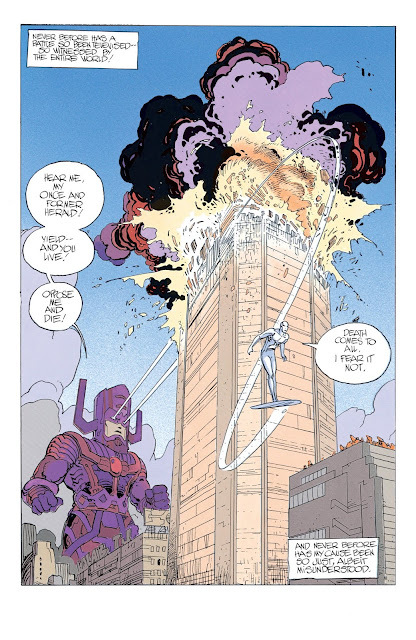 Moebius took one of the most ridiculous Marvel villains and gave him a sense of size and power that makes you believe that he COULD throw mankind into chaos with a demand to be worshiped. Together, the two of them have crafted a quite interesting comic. 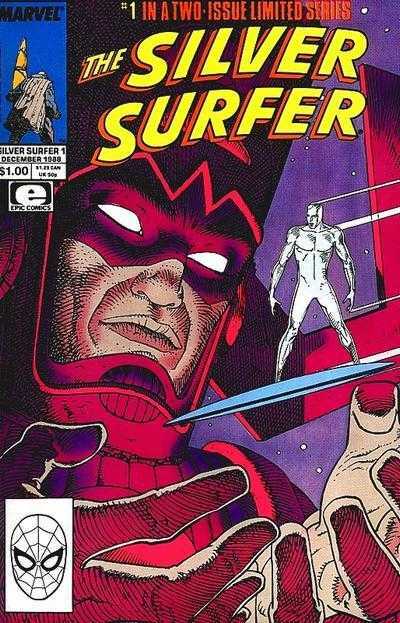 The Silver Surfer confronts his former master and demands to know why Galactus has broken his vow not to attack Earth. 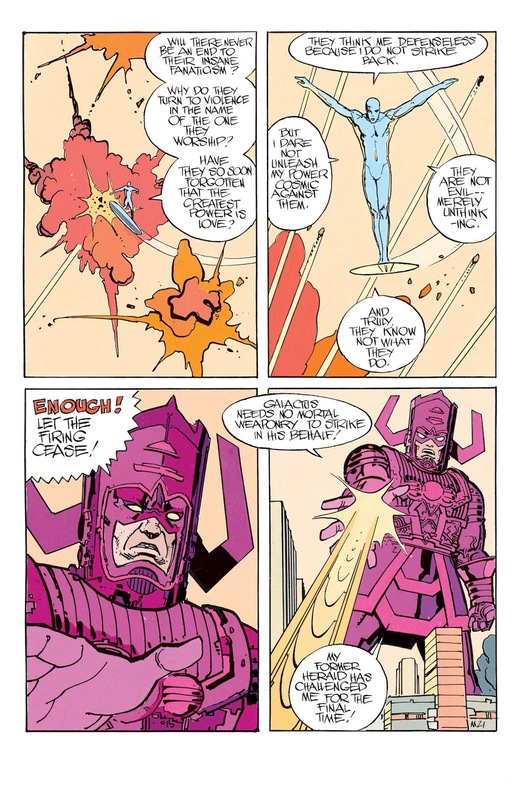 Galactus smugly informs his former herald that no vow has been broken, and that he has done nothing except allow humanity to destroy themselves by choosing to worship him as a God. Silver Surfer decides to take his case to the people, but his pleas for humanity to not follow Galactus without question fall on deaf ears and the Surfer is attacked by the military for speaking against "God". Their attacks do no harm and the Surfer doesn't retaliate, which makes Galactus angry enough that he takes up the battle with Silver Surfer himself. 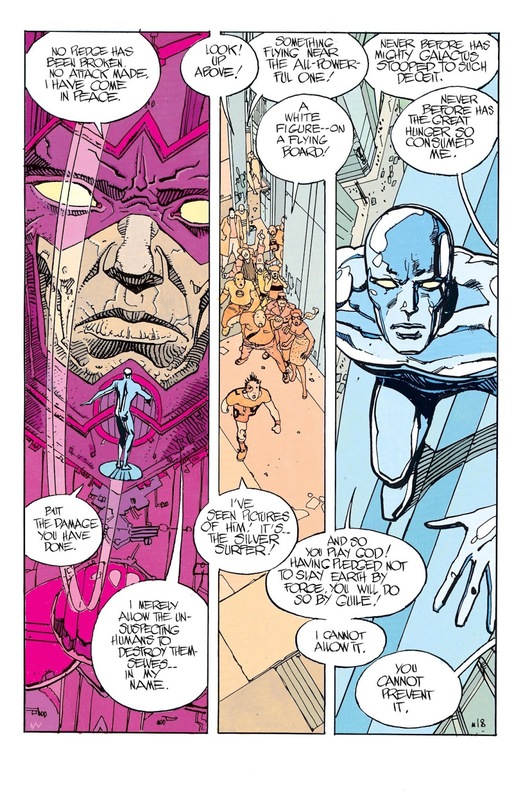 As the battle between the Silver Surfer and Galactus rages across the city, it becomes clear to the onlookers that while Galactus has no care for the damage and destruction he is causing, the Surfer is trying his best to save bystanders caught up in the fight, even though they were attacking him only a short time ago. Finally, the sister of Galactus' self-proclaimed prophet is killed during the battle in full view of the world as the Surfer begs him to stop the destruction. 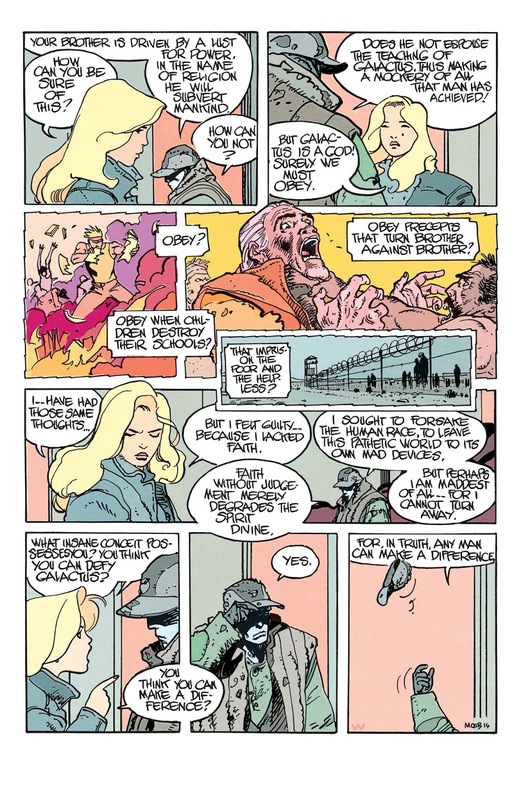 The "prophet" publicly denounces his "God" and the U.S. Air Force attacks Galactus, making him realize that his ruse is over and humanity no longer worships him. Galactus ends his battle with Silver Surfer and leaves Earth. . .but not before promising to return again because he is eternal and man's memory is not. 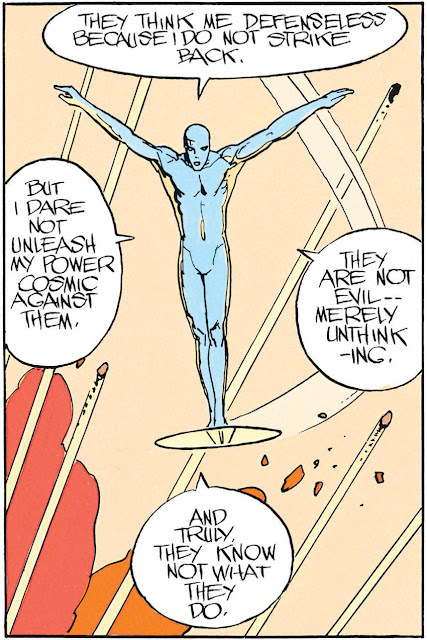 In the aftermath of Galactus' short reign and his defeat, Silver Surfer is invited to the United Nations, where the leaders of the world now want HIM to be their God. The Surfer is disgusted that mankind learned nothing from the recent events and purposely makes such impossible demands as a condition of his worship that the Surfer is immediately denounced as a tyrant. As he leaves, only the former "prophet" of Galactus realizes that the Surfer sacrificed his chance to be a God for the greater good. . .but by then, the Surfer is gone and it's too late. In the end, Silver Surfer is alone and hated by humanity. He can only look down on the planet from space and wonder if it's worth protecting at all. As you can see, the religious allegories in this issue are not exactly subtle. There are several layers to be found that question religious belief in general and organized religion specifically. The title of this story is "Parable" and this second issue takes that to heart. . .giving us a battle between organized religion and humanistic agnosticism in the guise of a fight between Silver Surfer and Galactus. There are a lot of questions asked during the course of this issue, and the answers are mostly left up to the reader to decide. It really shows a different side of Stan Lee than what is normally presented, and I can sort of see why this story generally flies under the radar even though it seems to be pretty well regarded. It's a thoughtful story that (although it's a bit heavy handed, to tell the truth) asks the reader to look not only inside themselves, but at the world around them. It doesn't ask "What would Jesus do?" but "What would YOU do?" Basically, this is not so much a Silver Surfer vs. Galactus story as it is a parable illustrating the conflict between organized religion and humanistic agnosticism. If that sentence made you grit your teeth a little, then this comic is probably not going to be for you. If you want to see a side of Stan Lee that isn't often on display, paired up with one of Europe's finest artists for a one-time collaboration, then this story is definitely worth a look. This is an unusual story, to be sure. And it's not for everyone. But you can feel the spirit of Stan Lee in this story as he uses the comic medium that he loved so much to give us the message that you don't need God to be good, you just need to choose to be good to each other. To me, that's as fine a memorial to the late, great Stan "The Man" Lee as any. Back to Longbox Junk business as usual. I like your pick as a tribute to Stan Lee. I've never read this short limited series, but I'll most certainly grab it up if I run across it. You've done a masterful job at bringing up the crux of Lee's message, it appears, from my perspective of not having read it but trusting your judgment. As much fun as it may be to grab a Superman or Thor comic and consider them "Gods" amongst the people of the Earth, this is the kind of comic book that makes us think a little deeper than usual. A fitting tribute the legendary writer (and Moebius as artist). Thank you for including these books, and as more of an under the radar type tribute to Lee too. I have enjoyed many of the stories that he put out, but have not had the luxury of seeing this one. An added bonus is that it is an early Moebius comic work too. This is one that I will be looking for now, especially knowing that it can be found at a bargain still. I went back and looked at the artwork a little more. Moebius' version of Galactus is pretty amazing. Such clean lines, and a great interpretation.